In the UK we take water supply for granted and expect to have a clean, cheap and secure water supply. The problem with this thinking is we forget the real costs and problems with this resource. For farm and equine businesses, it was calculated from a UK wide agricultural business survey that on average businesses pay between £1.40 and £2.00 per 1000 litres of water and use 2500 litres of water supply daily costing between £3.50 and £5 per day or £1277.50 – £1825 annually. The water supply cost that cannot be calculated is the damage that the water industries aged infrastructure can do to our livestock and machines. 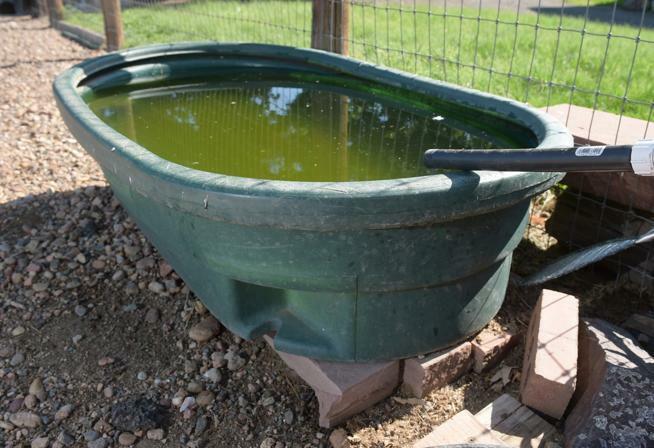 How many water troughs do we see with a build-up of green algae or slime like the one below? The problem comes really from the age of the pipework carrying the water to its destination. Water authorities simply cannot keep up with the maintenance required to keep pipework in pristine condition, and they are not responsible for separate water supply pipes to individual properties. 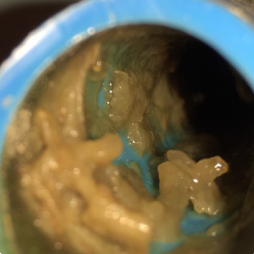 Even though most pipework is now MDPE it is here that bacteria grows by the formation of biofilm. Below is a picture of the inside of a water supply pipe feeding water to a dairy farm in Lincolnshire. This pipe was installed 18 months ago. As we can see clearly contaminants have built up to form a layer of bacteria that is in contact with all water delivered along this pipe, in to the livestock’s water troughs and then into the animal’s gut. Yes, the water supply being delivered from the water company is treated, but as it is treated at source it doesn’t stop the contamination building up in the pipes on your premises prior to use. Therefore were there is water we continually see a build up of algae and green slime, effectively it is a breeding ground for bacteria, not something we want our animals drinking! For the super performance characteristics, chlorine dioxide has been described as the “ideal” biocide. It is now included in many drinking water hygiene programs around the globe. Complete testing has confirmed the safety of chlorine dioxide. This includes extensive studies by the Environmental Protection Agency (EPA) and World Health Organization (WHO).